The new Lagoon 39 fits between the Landmark Lagoon 380 and the new S2 version of the Lagoon 400. However her design follows with the new Lagoon 52 apparent on first sight: vertical, bevelled bows, aerial cabintop above the deck, and abaft positioned mast for sailing performance and ease of handling. Lagoon 39 VPLP’s touch goes far beyond all this: the simple, efficient deck layout allows to control the main maneuvers from the steering station, the wide side decks are safe and uncluttered and the stern platforms are designed for an easy, protected boarding. 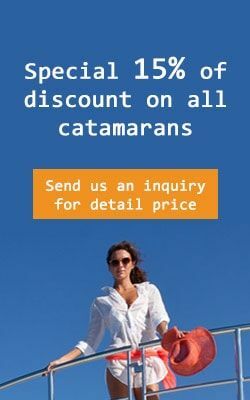 Book now and enjoy perfect catamaran sailing in Greece!